If you like Guardians of the Galaxy then come check out this Star-Lord t-shirt. You can get this black Marvel superhero t-shirt in men’s sizes Small – 5XL and it is made from preshrunk cotton. ON the black shirt you can see a square that shows the face of Star-Lord and then on top of that you can see a full color picture of Star-Lord as if he is climbing out of the square and then to make it all official they added the Guardians of the Galaxy logo below the Marvel superhero. So now you can show all your friends that you like Star-Lord best of all the Marvel superhero’s by simply wearing this shirt. 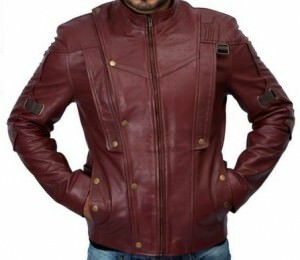 This is a leather jacket that is based after the cool character Star-Lord from the awesome movie Guardians Of The Galaxy, it is a deep dark red and features many buttons and a full front zipper closure. Made from real genuine leather this will be a very durable jacket that will also be very comfortable, it is available in a huge selection of sizes that will range from XS to 3XL so every new Star-Lord can suit up. The Star Lord leather jacket will be perfect for any occasion dress it up with dress pants and dress shoes or wear it with a pair of blue jeans and sneakers. Get a closer look at the Guardians Of The Galaxy Star-Lord Leather Jacket. Peter Quill likes to refer to himself as the Star-Lord, but who is he kidding? He was always Star-Lord ready to become one of the Guardians of the Galaxy. Star-Lord is in his full gear to take on the galaxy. He has his mask on, his element guns in hand and ultimately his suit that helps with his strength and durability. This soft magnet measures 3.5 inches tall and is made of soft and bendable plastic. It makes it the perfect piece to put on anywhere a magnet will stick. Hold up your important papers with the Soft Magnet Of Star Lord. There is Star-Lord from the Guardians of the Galaxy. Oh wait it’s not Star-Lord but just a person dressed up like him and look how much he looks like the read Guardians of the Galaxy star. You can be Star-Lord to by simply wearing this Guardians of the Galaxy costume. The costume includes the jacket, bandolier and of course the mask. And this adult Halloween costume comes in different sizes to make you look like the perfect Star-Lord. Costume parties are fun again when you can show up like Star-Lord from the Guardians of the Galaxy. 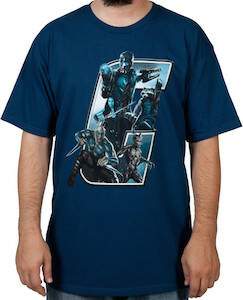 This blue t-shirt shows the Guardians of the Galaxy. On the blue shirt you can see a big G from Guardians of the Galaxy and out of that G 5 character climb out. Star-Lord, Drax, Gamora, Groot and Rocket Raccoon are all inside the big G.
This Marvel t-shirt is fun because it’s different and this 100% cotton t-shirt comes in sizes Small – 2XL. Adults like you will just fit perfect in a t-shirt like this and that is why you should at least have a better look at the fun design of this Guardians of the Galaxy t-shirt. So don’t wait come get this Guardians of the Guardians of the Galaxy Big G T-Shirt. 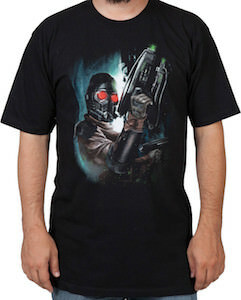 This black Marvel t-shirt shows Guardians of the Galaxy member Star-Lord. 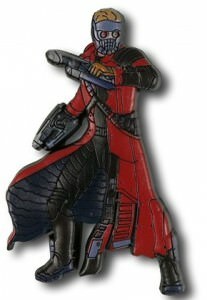 And this time Star-Lord is ready for action wearing his fancy mask and holding his weapon ready. 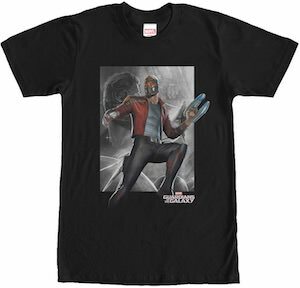 The whole feel of the black t-shirt and the lights around Star-Lord make this t-shirt just look amazing. You can get your own Star-Lord action t-shirt in sizes Small – 2XL and all made from 100% cotton. Just imagine wearing this Marvel Guardians of the Galaxy t-shirt to school, work or just when having fun. I know that seems like an awesome dream that can come true for you. If you like this t-shirt then do not wait and just order your own Guardians of the Galaxy Star-Lord T-Shirt. This ceramic mug will make your morning coffee more exciting. The mug is 20oz and has a black inside color and a black handle and the rest of the mud is covered in the Guardians of the Galaxy. 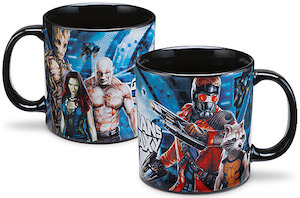 Besides the logo of this Marvel movie you can also find Groot, Star-Lord, Rocket Raccoon, Drax and Gamora on the mug. And besides coffee this mug also loves water, tea, juice and maybe even a mug cake as it is microwave and dishwasher safe. Just imagine using this mug at work instead of those stupid paper cups. For sure you will be the owner of the coolest mug at work. So do not wait any longer, just come get your Marvel Guardians of the Galaxy Mug. 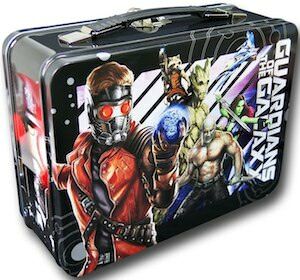 If you are looking for the perfect lunch box for school or work then you can to the right place as this is the Guardians of the Galaxy lunch box. This metal lunch box has a picture of Rocket Raccoon on one side and the whole group on the other. Yes Star-Lord, Gamora, Groot, Draxy and again Rocket Raccoon are all on this lunch box. With Guardians of the Galaxy being so cool you of course want the perfect box for you home made lunch. Kids in school and coworkers will all look and think wow why don’t I have that. So get ready for a great lunch with this Guardians of the Galaxy Lunch Box. Want the Guardians of the Galaxy in your bathroom? 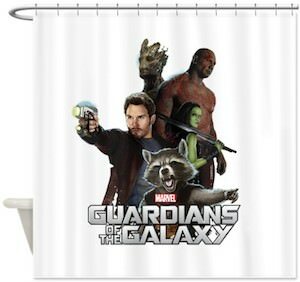 You can have Groot, Star-Lord, Gamora, Drax and Rocket Raccoon in your bathroom but just as a picture on your new shower curtain. This Marvel Guardians of the Galaxy shower curtain is white and shows the Guardians of the Galaxy logo and above a picture of the guardians. And all 5 are ready for battle. This Guardians of the Galaxy shower curtain is 69 x 70 inch and is made from soften polyester witch makes it easy to clean and a shower curtain that can almost last for ever. Now is the perfect time to dress up your shower with this Marvel Guardians of the Galaxy Shower Curtain. School, work and play all need a place to store your stuff that is easy to carry and with plenty of space. Backpacks are ideal for that and now there is this amazing looking Guardians of the Galaxy backpack. 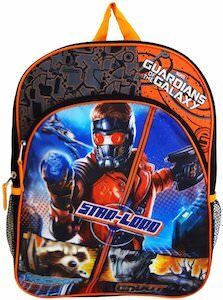 This backpack has one big main compartment and in front of that a smaller compartment on witch you can see Star-Lord, Rocket Raccoon and Groot. And this Marvel backpack also has two mesh side pockets giving space for easy storage for things like water bottles or maybe an apple. This Guardians of the Galaxy backpack is 16 x 12 x 5 inch and ideal for school. Come and have a better look at this Marvel Guardians of the Galaxy Large Backpack.